I made dosas for brunch a few weeks ago and realized at the last minute that I had no potatoes on hand to make the potato masala. So I improvised and made the filling with the two vegetables I did have on hand- kale and butternut squash. It was such a successful variation that it is something I made again this weekend. I think this is our new favorite dosa stuffing. The recipe I used was much the same as my usual potato masala recipe. 1. Cube and cook (microwave steam/roast) 2 cups butternut squash. Set aside. 3. Add 1 medium onion, cut in half and sliced thickly. Cook until translucent. 4. Add salt, turmeric and a small dab of ginger garlic paste. 5. Add 1 bunch washed and chopped kale and stir-fry it for 12 minutes or until the greens are tender. 6. Stir in the cooked butternut squash. Cook for a minute more and the masala is ready. 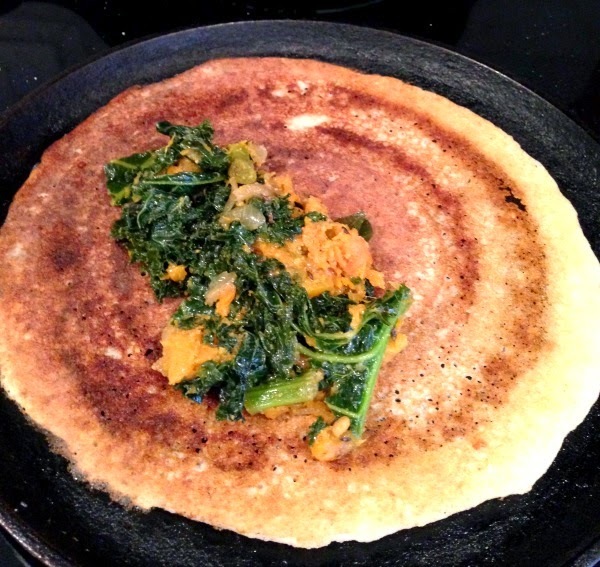 Fold in the masala into a dosa before serving. It is a versatile dish and can be used in other ways and other meals; I have some of this masala left over and tomorrow morning, it will accompany a fried egg at breakfast. 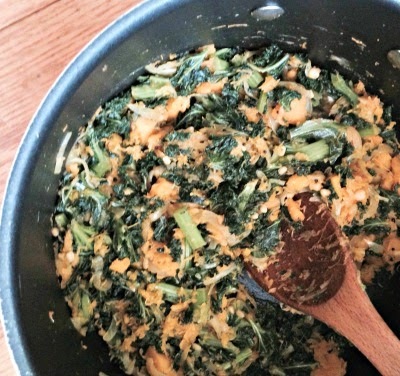 The kale-butternut squash masala has a wonderfully complex flavor- a bitter hint from the greens and the sweetness of onions and squash, plus the savory notes of the spices. It complements the dosa so well. And the colors are beautiful. I love greens but don't seem to eat them as much as I like, so this recipe is a good one for me to make again and again. (And any greens would work in place of kale). Dosas are a favorite of mine, and even as I'm cutting down on carbs on a daily basis, dosas continue to feature in weekend breakfasts every couple of weeks. Instead of eating 3-4 at a sitting, I'm eating 1 or 2 at the most, with a larger portion of eggplant sambar and coconut-cilantro chutney and a filling featuring green leafy vegetables. A fun thing happened last week- I got a box of goodies in the mail. My blogger friend The Cooker has started a small business called The Roost Boost- creatively crafted care packages. 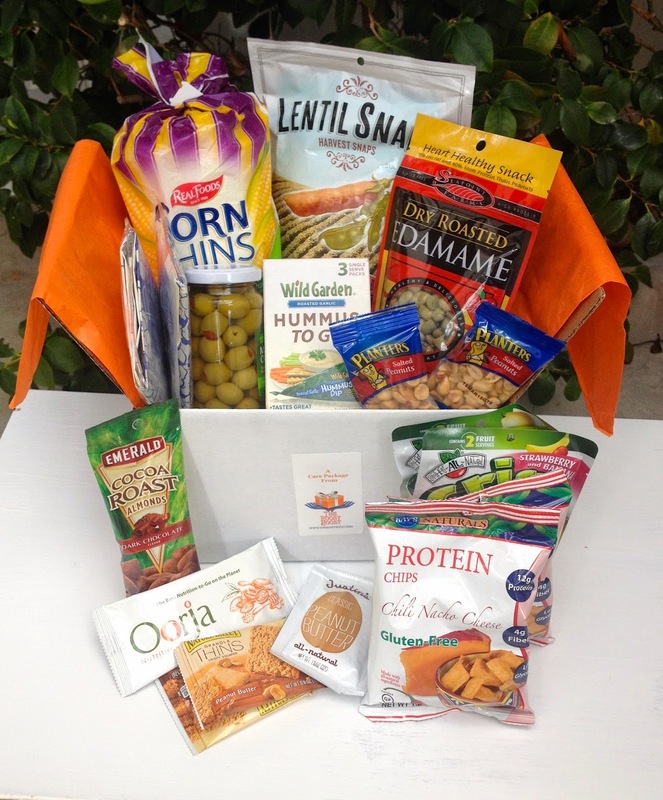 She sent me her low-carb care package to try so I got to nibble on tasty snacks all week- olives, roasted peanuts, almonds and edamame, popcorn and hummus. Two items that were new to me and very tasty were nacho-flavored protein chips and oorja whey protein bars. It is hard to come up with ideas for snacks that are lower in carbs and can be sent in the mail, so I was impressed with her selection. It is a thoughtful way to send treats to someone who may have a very limited range of goodies that they can safely eat. Good luck to The Cooker and her new venture! Hi Nupur, been reading all your posts since the start of the year. Just returned from an emergency trip to India where my brother was very sick due to complications that arose from uncontrolled sugar levels. Apart from the diet, I learnt that diabetics have to take good care of their feet. An innocuous looking infection started in my brother’s big toe, became a monster and then the infection spread to his spine. He has had 2 surgeries in a span of 2 months. I am so happy that you have brought up the topic of diabetes which people in India seem to take very lightly, until something serious crops up…. because I don't remember it being made in my parents' home) but greens are easily substituted for each other, just chop and saute as usual. I will definitely try this recipe. I have been making better carb choices since you first posted about this and I feel so much better! I love all your suggestions and recipes. I will definitely be trying this recipe later this week. Thank you! Thanks Michelle! Good luck to you. I have enjoyed some leftover sweet potato-methi masala with dosas so I can totally see how this combination would taste. Great idea Nupur! That care package is truly wonderful and so thoughtful. I am eyeing the Orja bars, I am not much into bars but I am keen on giving this one a try. Mmm- methi would be wonderful here. I just don't have access to fresh methi where I live. I'm not into protein bars either and not at all interested in eating them regularly but I must say this one was a very tasty treat. I remember feeling awed by 101 dosa corner in Vashi, a long time ago, all sorts of combinations were listed and they sounded so appetizing. Oh man this dosa corner sounds amazing! I love the squash-kale combo. Kale also pairs well with sweet potato. But, unfortunately I cannot make dosa to save my life. Couple of tries many years back with disastrous results left me scared from making dosas at home. They are one my favorite foods but I keep them as treats now when I visit my favorite south indian restaurant in the bay area. Or once in a while we get the ready made batter from the indian store. Have a great week.